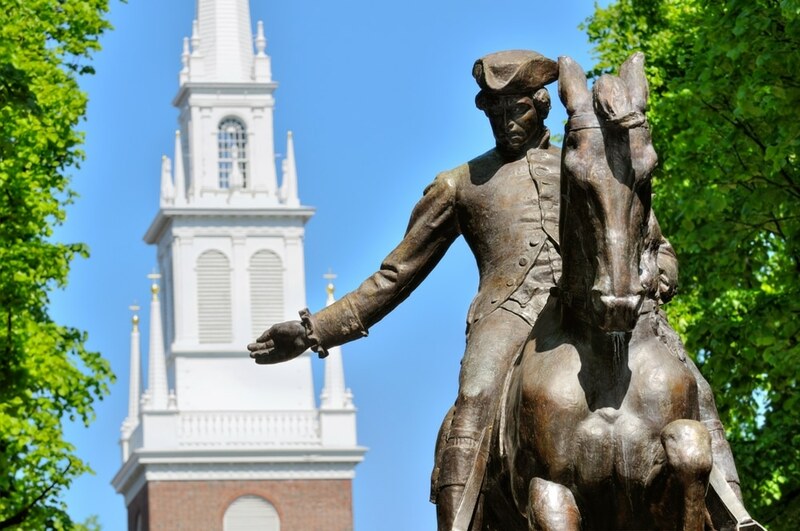 Tourico Vacations on Massachusetts – The Old North Church of Boston Massachusetts – Grade school children learn each year about the man named Paul Revere, who rode a horse shouting to save his fellow colonialists. The Old North Church played a significant role that evening, and is the oldest church in Boston that has survived through history. The route Paul Revere rode that evening is known as the Freedom Trail, and Old North Church is known as the most frequently visited site on this trail. The church is located at a site that has since been dedicated as the Old North Historic Site. This site also houses the Clough House from 1713. It is known for being one of the first (and still surviving) brick houses in Boston, which today is the home of Edes & Gill’s printing offices and a rustic local chocolatier’s shop. Italian immigrants built a chapel in 1918 which is also along this famous route, and is now known as Old North’s Gift Shoppe. There are also a few large courtyards, a couple of formal garden spaces, as well as a memorial to the soldiers who have perished during their time fighting in the Iraqi and Afghan wars. Also at the Old North Historical site are two townhomes that were converted for use in various educational, parish, and civic programs. Known officially as Christ Church but to locals as Old North Church, the church was built around 1720. It is Boston’s oldest church still in existence today, as well as Boston’s most frequently visited site of historical value. Just before the Revolutionary War, the majority of the members of Old North’s congregation will still loyal to Britain, many of which held positions within the British government. In fact, the silver used during services, and even the Bible from which the clergy read was given to the church by the King of England. This made one man’s loyalty to the cause of the patriots even more fantastic. On that fateful evening in April of 1775, two men climbed to the top of the church’s steeple holding two lanterns as high as they could. This was Paul Revere’s hint that the British were indeed coming, and they were coming by sea. And the rest, as they say, is history.